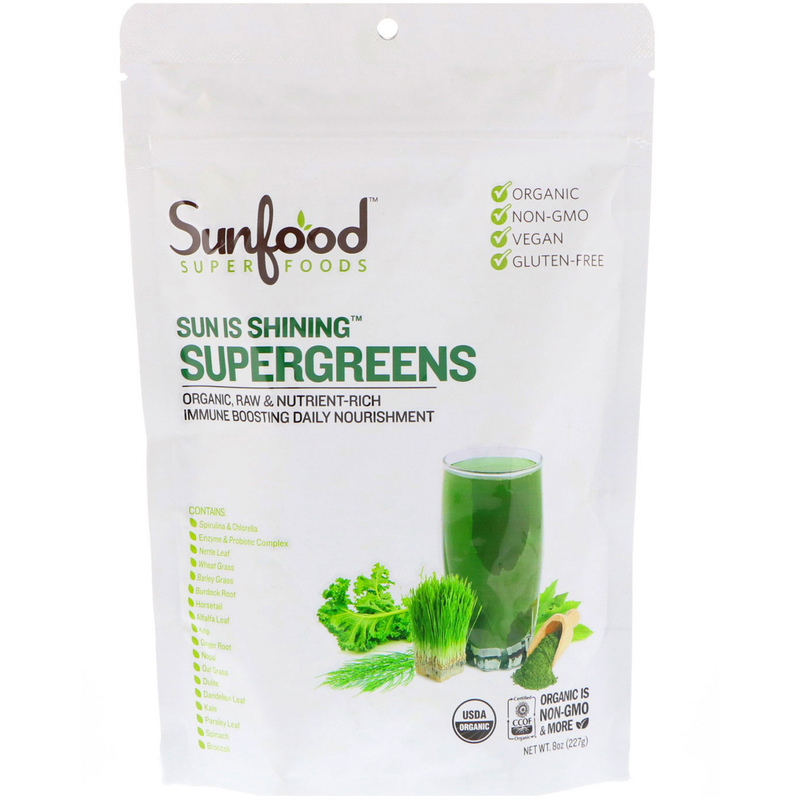 Sun is Shining Supergreens is a dynamic whole-food blend of 19 organic green superfoods including grasses, dark leafy vegetables, herbs, algae and sea vegetables. Supergreens also contains a specialized enzyme and probiotic complex to support optimal gut health, aiding in digestive health and supporting a healthy immune function. This combination works to provide your body with incredible nutrition, while simultaneously alkalizing and energizing your inner ecosystem. There is no other green superfood blend as robust and advanced as Supergreens! 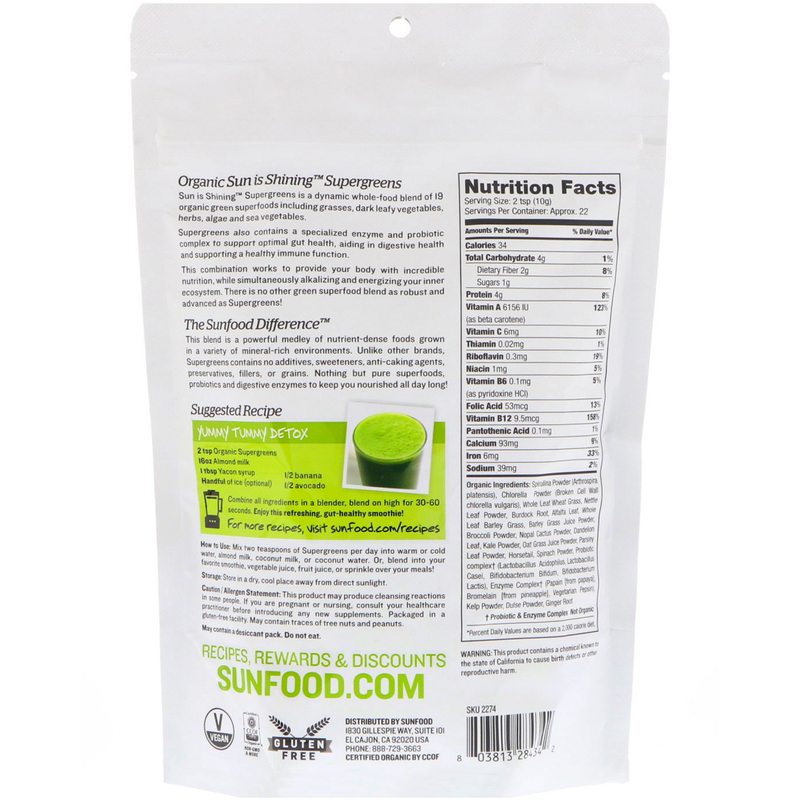 This blend is a powerful medley of nutrient-dense foods grown in a variety of mineral-rich environments. Unlike other brands, Supergreens contains no additives, sweeteners, anti-caking agents, preservatives, fillers, or grains. Nothing but pure superfoods, probiotics and digestive enzymes to keep you nourished all day long! How to Use:?Mix two teaspoons of Supergreens per day into warm or cold water, almond milk, coconut milk, or coconut water. Or, blend into your favorite smoothie, vegetable juice, fruit juice, or sprinkle over your meals. Spirulina powder (arthrospira platensis), chlorella power (broken cell wall chlorella vulgaris), whole leaf wheat grass, nettle leaf powder, burdock root, alfalfa leaf, whole leaf barley grass, barley grass juice powder, broccoli powder, nopal cactus powder, dandelion leaf, kale powder, oat grass juice powder, parsley leaf powder, horsetail, spinach powder, probiotic complex? (lactobacillus acidophilus, lactobacillus casei, bifidobacterium bifidum, bifidobacterium lactis), enzyme complex? (papain [from papaya], bromelain [from pineapple], vegetarian pepsin), kelp powder, dulse powder, ginger root. ?Probiotic & enzyme complex not organic. Allergen statement:?This product may produce cleansing reactions in some people. Packed in a gluten-free facility. May contain trace of tree nuts and peanuts. Caution:?If you are pregnant or nursing, consult your healthcare practitioner before introducing any new supplements. Storage: Store in a dry, cool place away from direct sunlight. This product contains a chemical known to state of California to cause birth defects or other reproductive harm.